Samantha here, and today I'm sharing another layout using (mostly) the same supplies as last week's scrapbook page! Since last week I made my littlest Mann's school year page, it was only fair to make one of my oldest little Mann's year! Here's how I made this layout! - first I spread some gesso onto the patterned paper. 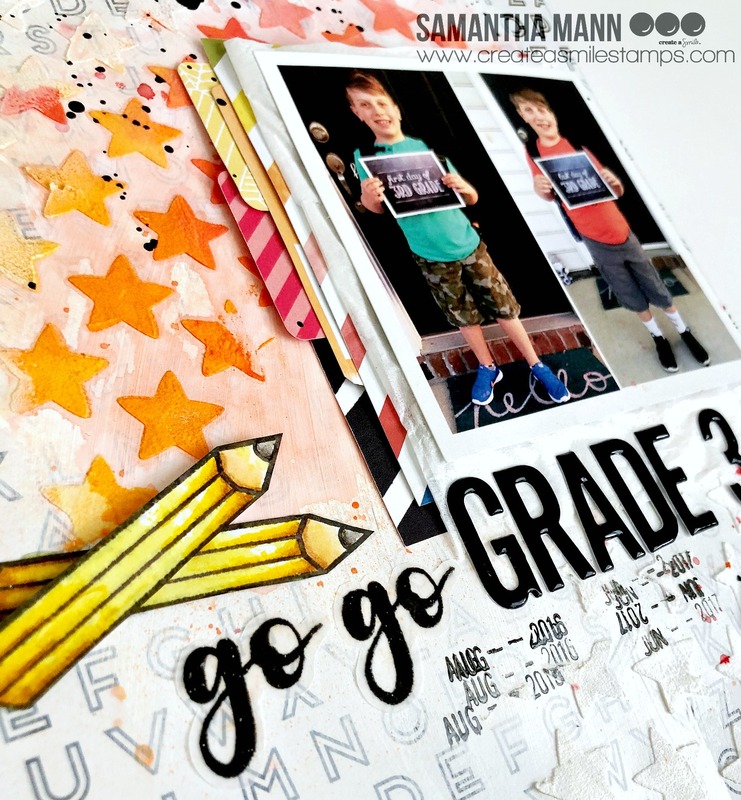 once ti was dry, I used a stencil and some white embossing paste to add the stars! - when the embossing paste was dry, I sprayed some Abandoned Coral and Carved Pumpkin Distress Sprays over it! LOVE how that looks! 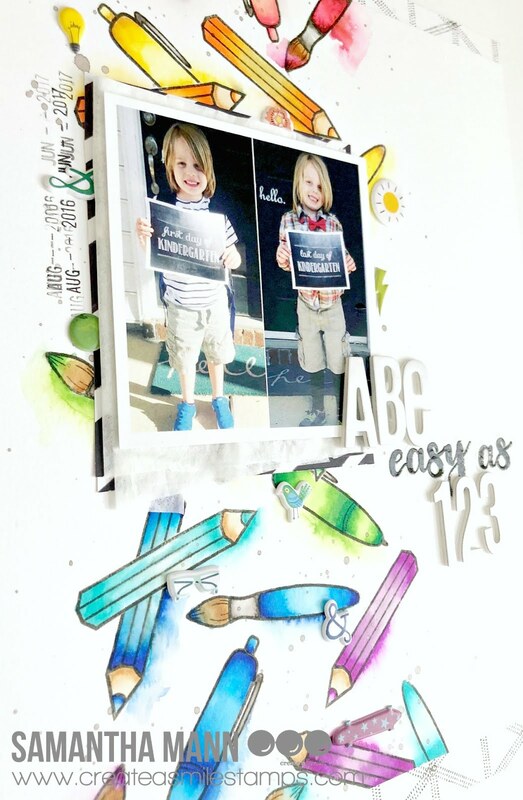 - I used similar colors of patterned paper to back my photo and then popped it all up on my background! - I heat embossed part of the sentiment, and combined it with some very 'proper-school-like' thickers! love the script and straight contrast in the title! 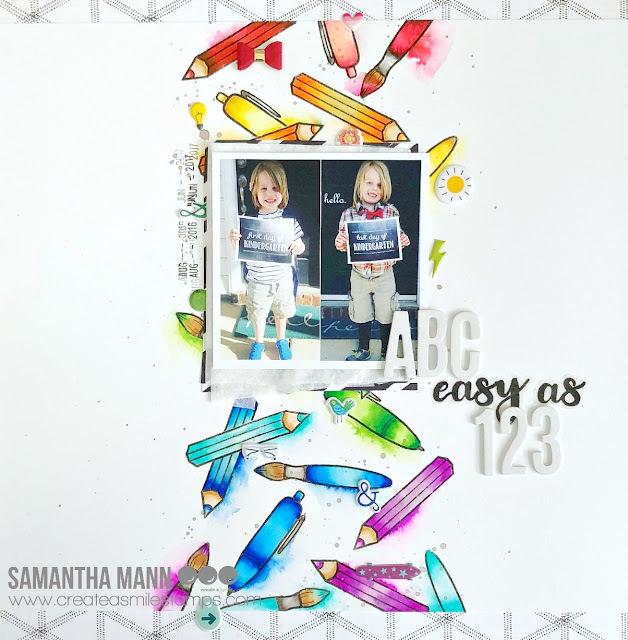 - the pencils were stamped and colored with Zig Clean Color Real Brush Markers and then added as embellishments all around the page! 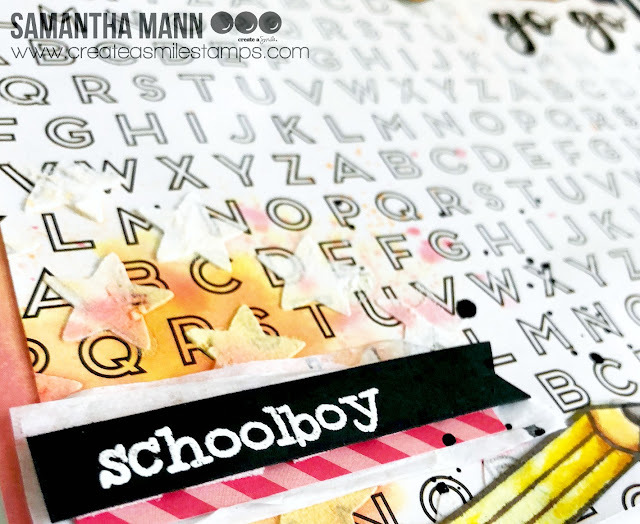 - I finished off the page by heat embossing the 'school boy' phrase onto a banner of black cardstock to tie everything together! I have to admit, I only love this layout 98%. 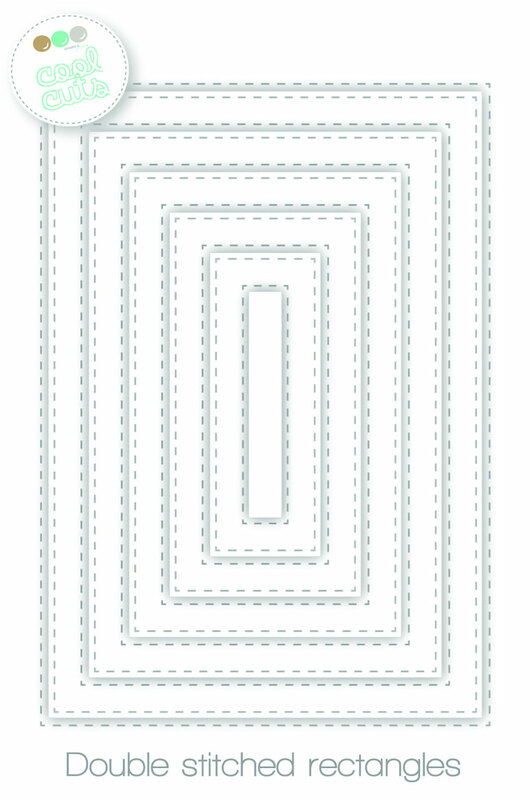 I really thought about tearing half of the patterned paper and then adhering it to a white piece of cardstock, just to add more white space and it make it look easier on the eyes...I don't know. I may still go back and do that. Do you ever feel that way about your projects? 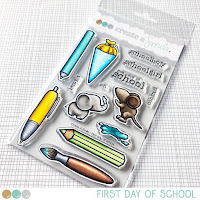 I used the First Day of School stamp set, and part of the title was created with the Clear Lettering Alphas! 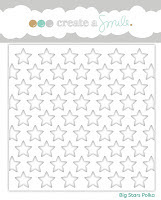 I also used the Big Stars Polka Stencil! Next week is the July release week!! And I can't wait for you all to see it!! It's AMAZING! Today I have a card for you with a lot of vitamin C.
I am a big fan of all citrus fruits and I don't know why it took me so long to use the set Fruit Salad. And I love the combination of yellow and turquoise. In my opinion these are the colours of summer. I started by creating the background. I used Distress Oxide Inks, Bristol Smooth paper, a lot of water and a stencil!! While the background dried I stamped, coloured and fussy cut the fruits. I die cut a circle from vellum and cut a stripe of black and a stripe of black and white paper to give the lemons a "stage". For the sentiment I chose one from the set Es ist serviert!/Served Up!. It says something like Sweet Greetings! I thought it would be funny with the lemons. 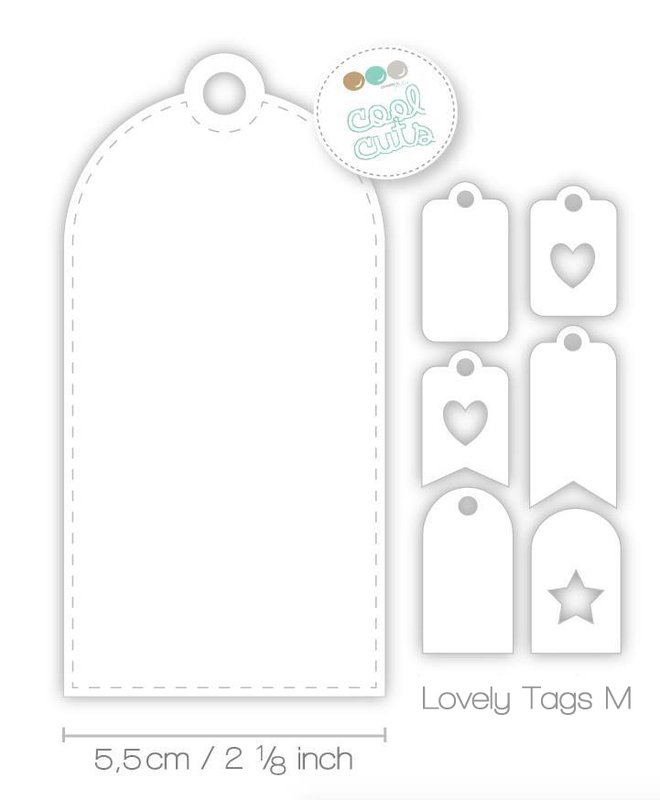 I stamped it on a tag and tight a little knot from black and white twine. 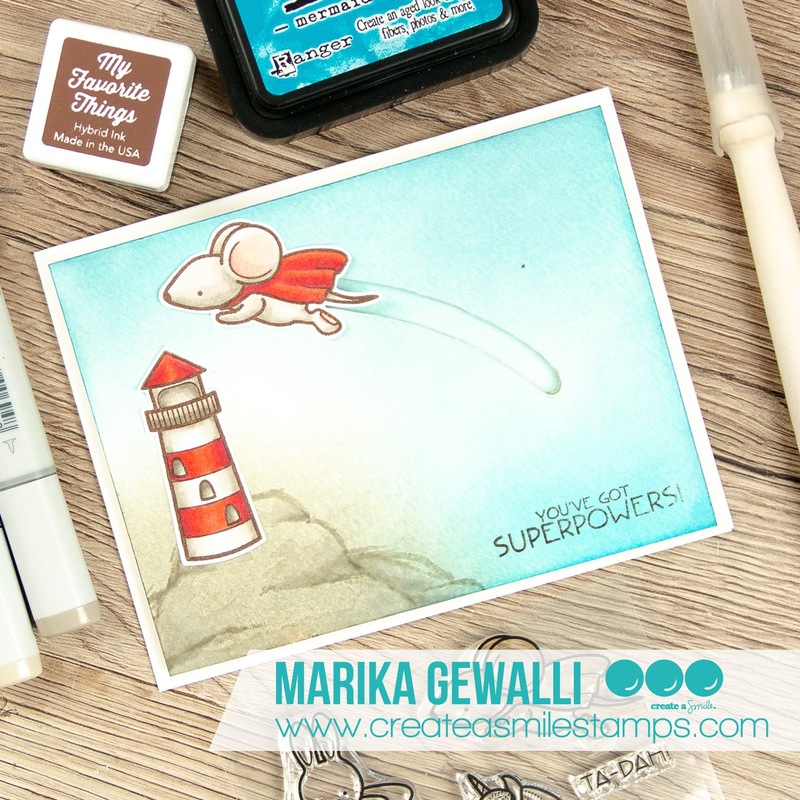 Show us your art work: Use #createasmilestamps when you're posting on Instagram! 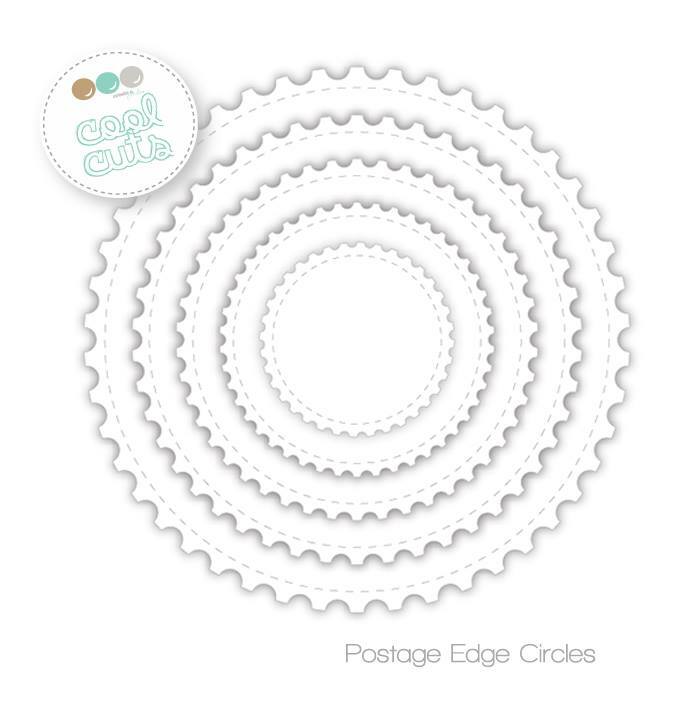 Raluca here with a brand new card showcasing the awesome "Vinyl Greetings" stamp set along with the "Music" cling stamp from the new Create a Smile Stamps release. After last week's card I decided to create a similar card, using the same sketch, but easier to create than the last one. * I die cut a white panel with the largest stitched rectangle die and mounted it on a bigger mint card base using craft foam. * On the panel I stamped the "Music" cling stamp using different ink pads, so I would get like a rainbow effect. 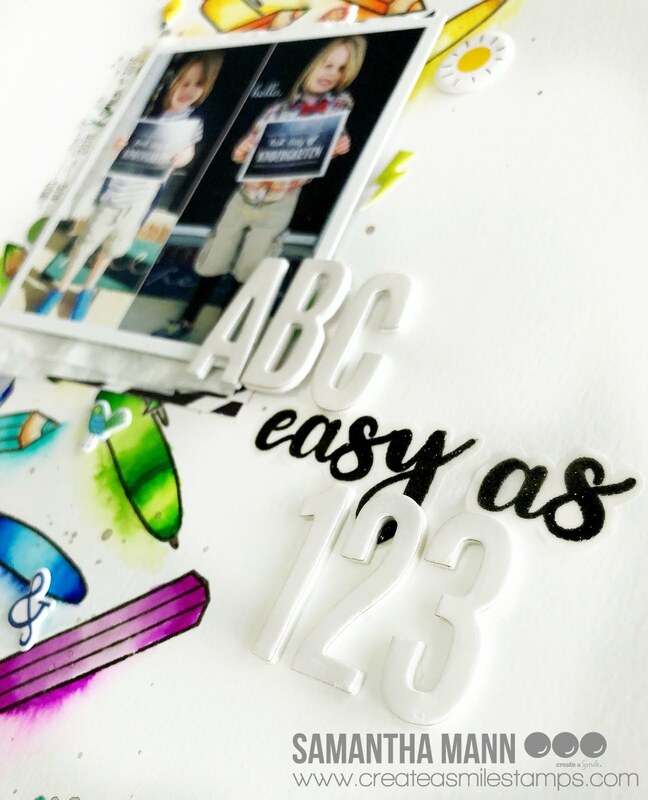 * On a white piece of cardstock I stamped in dark grey the vinyl and stamped one of the sentiments from the set using a purple ink pad. * I die cut it using a circle die and mounted it on the card. * Glued a few clear sequins and my card was done. Hiiii! !Who else loves succulents as much as I do? 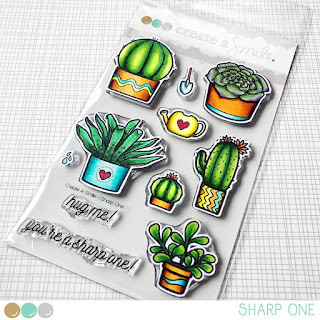 Well, today, I'm sharing a card that you can recreate for a friend or love ones that love succulents too! I'm using one of my favourite sets called Sharp One. I wanted to use a dark card base which unfortunately, the lighting isn't that great when I took this photo. But I wanted to take a break from my white card bases. Simply enough, this card was made just but stamping, colouring and cutting it out. The beautiful stamps really speaks for itself. I wanted to use my leftover patterned papers from the Beach Party Kit to add a bright yellow to ground the plants. 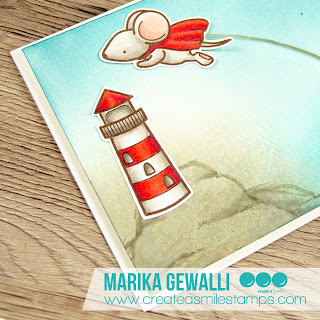 I hope you like this card and give these stamps a try! 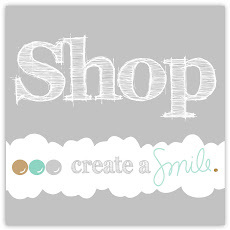 Head to the store and check them out. Hi Everyone, Marika here with a new card. 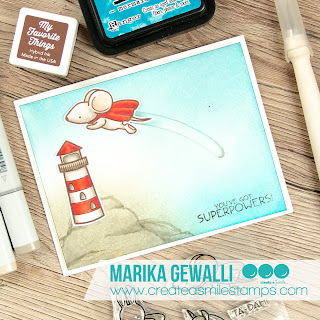 I just love making interactive cards, and when I saw the super mouse from the Superpowers stamp set I just knew I needed to make him fly. I wanted him to be movable and I wanted him to fly over something, so I dug through my Create A Smile Stamps and found the lighthouse on the Glowing Seaside Stampset. I felt it would be perfect for the scene that I wanted. I made the background very soft and not so much detailed so that the slider, mouse and lighthouse would be the focal point. 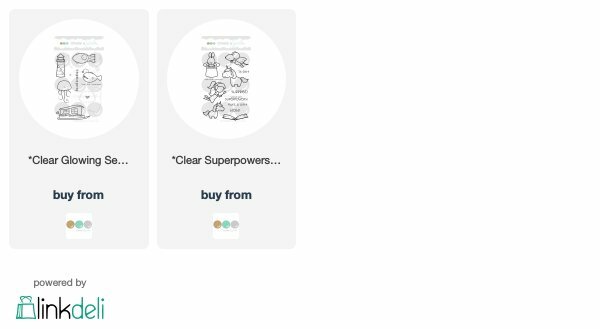 To see how I created the card you can watch my videos, the first one is showing how to put the card together, the second one is showing the coloring in realtime with commentary. My tip today is all about making your own slider track. When creating it try to imagine where on your image you are going to set the mechanism (in my case a little foamtape square), hover the image over where you are going start your track and draw a circle, just a little bit bigger than the mechanism. Do the same where you are going to end your mechanism. Then just connect the two circles trying to keep the lines parallel to eachother to make a smooth track. Then use a craft knife to cut it out. Samantha here, and today I'm sharing a rainbow-y, bright layout of my littlest Mann on his first and last days of school last year! I seriously LOVE the over-sized pens/markers/pencils on the newest First Day of School set, and I just knew they would be PERFECT to highlight a school themed layout! - next I colored in the images with Zig Clean Color Real Brushes and then used a waterbrush to draw the color out, around the areas! I LOVE the messy watercolor look! - once the watercolor-ed images were dry, I splattered some grey ink around everything! - then I layered some tissue paper and black and white striped paper behind my photo, and popped it up with foam tape! - lastly, I finished off the layout with lots of rainbow, color coordinated puffy stickers! I used the First Day of School stamp set, and part of the title was created with the Clear Lettering Alphas! Have you joined our Facebook Group Community? 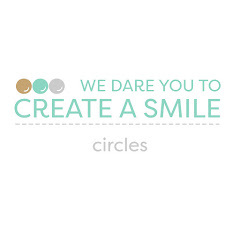 The Create a Smile Friends and Family group is such a fun group complete with challenges and daily inspiration! Winners from the Summer time challenge! Winners from Thank you challenge!